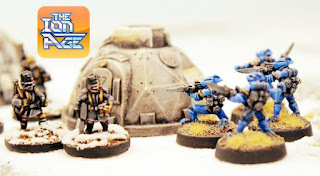 The 37th Planetary Defence Regiment lost thirty percent of its strength in the first moments of the Khanate invasion of Faercycle II. In the years since the abortive Prang raids the governor of the world had increased the military presence in the capital Ismere where the starport is located and also in other major cities such as Darga and Amatrall. 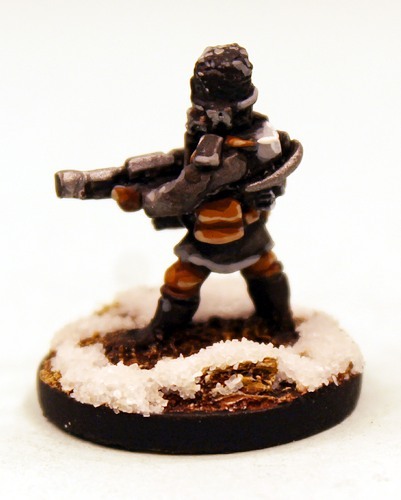 Cities like these sat atop deep mines sunk into the frozen planet in search of ore for the much in demand titanium for which the whole star system was known Precinct wide. News of the fall of Camarthen had reached Faercycle in 4331 IC less than two months after the relief fleet had taken the war back to the Shia Khan Empire there. What was not known was just how many Dragon Ships had fled from Camarthen Prime and plunged into deep space heading for nearby stars such as Faercycle. Without Ancep Drive the transits would take years, giving time to prepare, but equally it meant there was no way to track the aliens before they arrived in system. As it turned out it was a total of seven Dragon Ships which arrived at more than half the speed of light in 4338 IC rapidly decelerating before plunging into the atmospheres of Faercycle II and Faercycle III. The lack of orbital support prevented any of the large starships being destroyed before reaching the ground but warnings were sent out system and all space fold capable ships immediately evaded and left local space so as to prevent capture by the enemy. Ismere was the only place on Faercycle II which was bombed during the landings and this was thought to be in an effort to prevent effective air support of more remote locations. Being stationed on the rubbacrete landing fields the 37th Regiment was mauled by the projectile and destabliser rounds dropped in passing by Invader Alpha; the designation of that Dragonship. 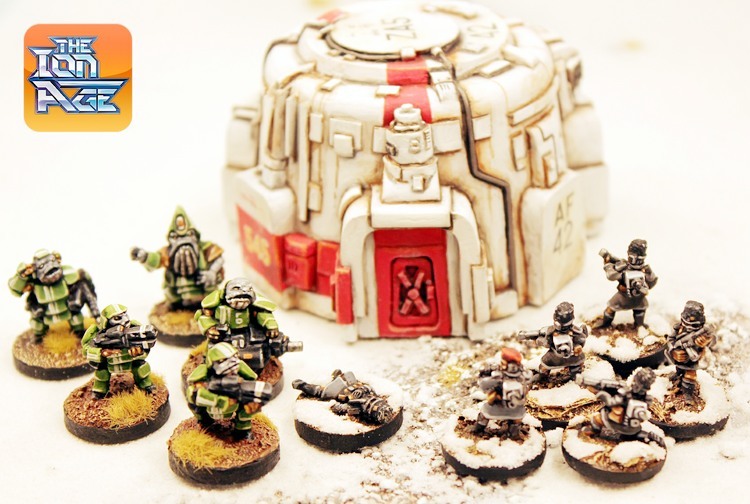 Ismere Starport was attacked by some forty five thousand Shia Khan troops from four different Legions once Invader Alpha had landed nineteen miles outside of the heated zone of the starport. They were faced by more than eighty thousand planetary defence force personnel as well as two thousand Retained Knights of the Lindworm Company and two dozen Starvaulters. Of the local forces stationed at the sprawling starport city only half of them were combat ready with the rest being pilots and other professions not useful in the battle due to loss of equipment and other reasons. Making use of their heated Aketon Mk III non-powered armour with synth fur outer layer and artic training what was left of the 37th along with the 9th and the 25th regiments engaged the aliens out in the tundra beyond the heated zone. The wind and freezing conditions lessened the numerical advantage held by the Legions and their screen of goblinoid Maigs were unable to break through. A retreat was called under intense pressure from Pioneers supported by Warlords and Psycoborgs for whom the temperature seemed less of an issue. In a battle which lasted four days the Khanate were eventually halted and repelled back into the snow and ice after a high water mark reached of the commercial district of Ismere. With the starport and its integral city burning and suffering power losses a choice was made not to pursue the aliens back to their starship...for the moment. With only patrols watching the swirling snows the rest of the military in Ismere set about assisting in ensuring fusion plants and other energy sources kept the underground heating systems in operation. They prevented a freezing which would have doomed hundreds of thousands of people. Reports came in from across Faercycle II and from the rest of the stellar system too. This was in no small part due to the valour expected of the Starvaulters who had repelled waves of Legionaries who were assaulting the primary dish array in the centre of the curtained area of the landing pads on the western edge of the starport. Those who survived were hailed rightly as heroes having accounted for more than a hundred times their own number. It seemed the third planet in the system had fallen to the Khanate after resisting and its signal went dark after a harrowing last stand which was broadcast live to Ismere. Amatrall city had also fallen after being burned almost to ashes. The city of Darga on the other hand had repelled the small force which had mounted an attack upon it and its own wings of Jangle verticopters and Punk dropships had come through completely intact. Governor Tumault of Ismere made the choice to allow Darga to take some of Ismere's troops and to then use its intact air transport to harass the aliens elsewhere distant on the planet. Ismere had the largest concentration of Dragon Ships and enemies nearer to it than other major centres of inhabitation so it kept back and then also brought in every Gytrash Quad Strider as well as every Steornede Battlesuit which could be taken from elsewhere. The governor made it known that the large force he had amassed would be setting out overland to destroy every enclave and starship the Khanate had one by one. This would be a mighty challenge indeed and it took several weeks for the regiments to be outfitted and organised ready to march. 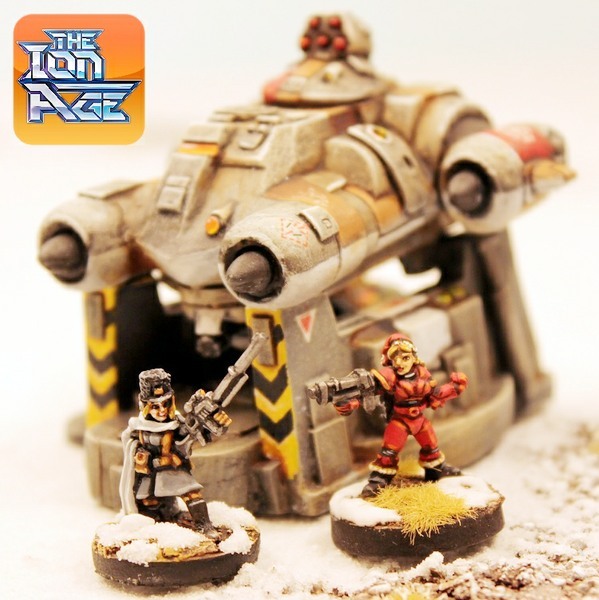 Its well into September and all of the releases for this month for The Ion Age are now online in all their glory! Some of the finest 15mm science fiction miniatures created by Sam Croes in my opinion. 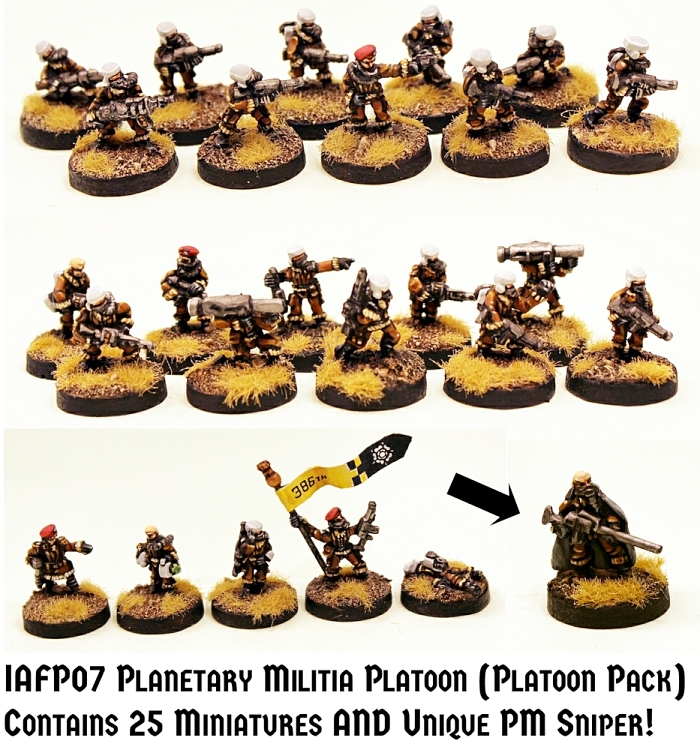 Super sharp and crisp and with excellent poses too we have new packs and a platoon for you. 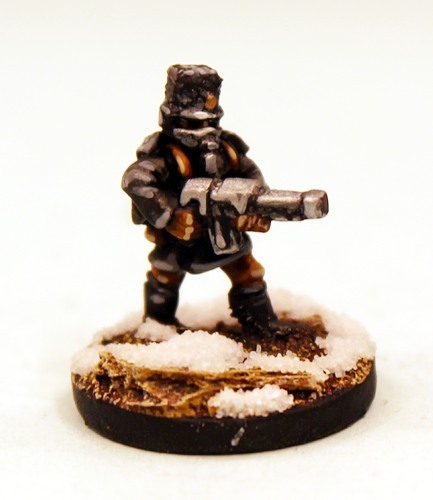 A brand new Planetary Defence Force comes into being with the Cold Climes Militia. 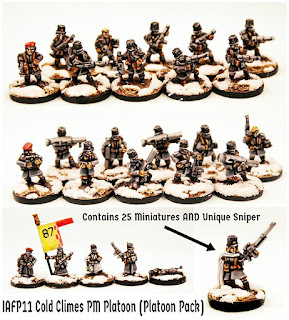 Two squad packs of ten different poses, a five pose command pack and a platoon pack with all of these and an extra free unique female sniper in it. 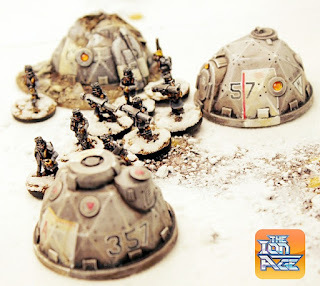 Go HERE or read on for all the information and to see some in game photos from our testing with these figures when we were trying them out against the Khanate, the Prang and those damned Ymel Sandworms too. Plus I hope you liked the little snippet of new fiction which introduced these figures. You did! Good. It will continue next month. 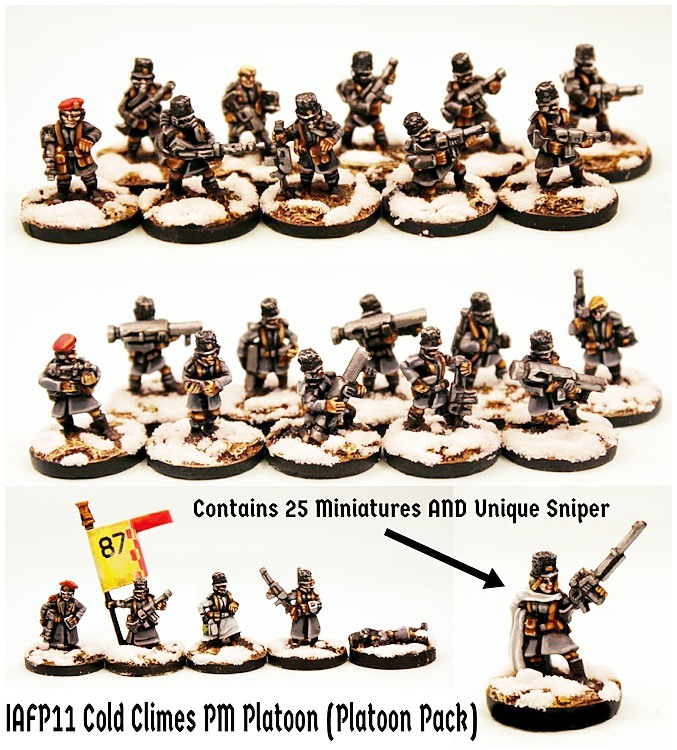 This is core rifle squad for your Planetary Militia Cold Climes 15mm defence forces. Pacification and Xeno Combat in remote and central locations. This pack contains ten different 15mm scale white metal miniatures including eight armed with Moth Type 6 Rifles, one with Pardoner Fire Projector and a lesser officer with Tumbler SMG. 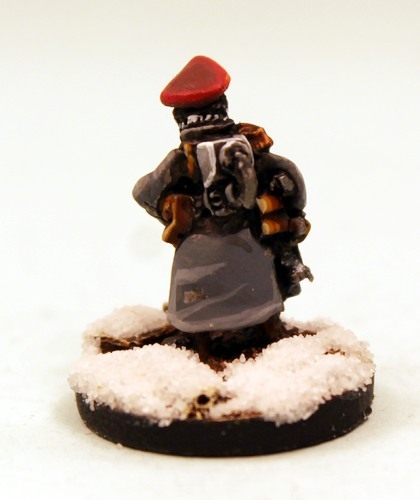 As always this code can be bought as a pack or as single miniatures or select the three packs and save 10% option on the page. Price 5.00GBP per pack. This is the support squad for your Planetary Militia Cold Climes 15mm defence forces. Dealing with tougher targets than civil unrest. 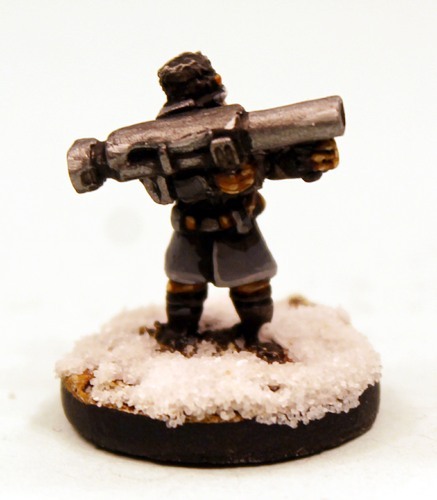 This pack contains ten different 15mm scale white metal miniatures including three armed with a Moth Type 6 Rifle, several loaders and four armed with the heavy Bodkin AP Rifle plus a lesser officer with Tumbler SMG. 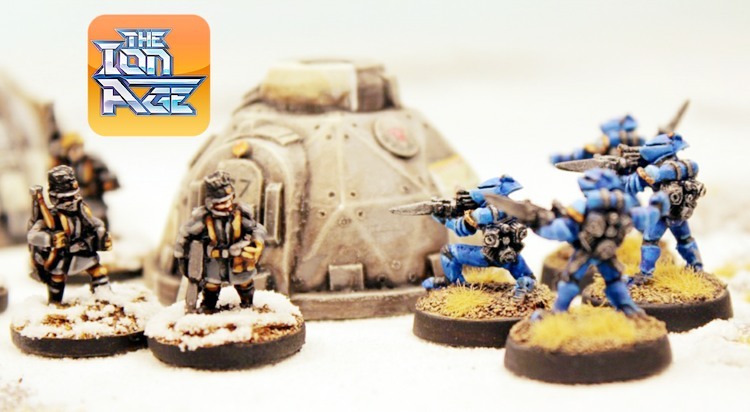 As always this code can be bought as a pack or as single miniatures or select the three packs and save 10% option on the page. Price 5.00GBP per pack. 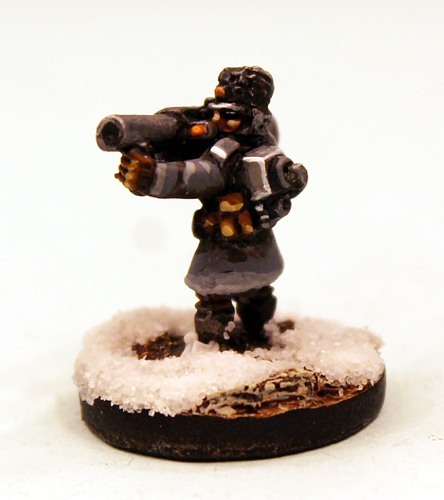 This is the platoon level leadership and specialist poses for your Planetary Militia Cold Climes 15mm defence forces. Co-ordinate the efforts to keep civil law in place on your planet. 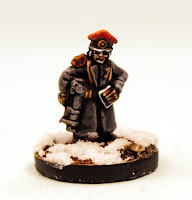 This pack contains five different 15mm scale white metal miniatures including a senior officer with Tumbler SMG and data slate, banner bearer with pole (bare, no flag included) and Moth Type 6 Rifle, medic with gear, comms specialist and a casualty trooper laying face up. 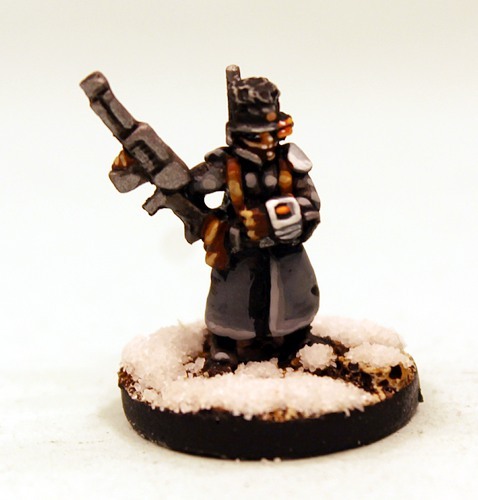 As always this code can be bought as a pack or as single miniatures or select the three packs and save 10% option on the page. Price 2.50GBP per pack. 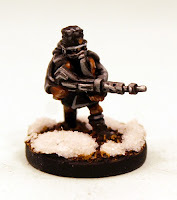 This pack gives you a full platoon of Cold Climes Planetary Militia as well as a unique miniature only found in this code. If you want to field a full force suitable for skirmishing then this is the code for you. Twenty five different miniatures which are IAF142 Cold Climes 1st Squad, IAF143 Cold Climes 2nd Squad and IAF144 Cold Climes 1st Command. 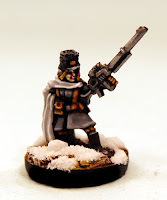 On top of this you get the unique miniature which is a female Cold Climes PM Sniper with a modified Moth Type 6 Rifle in cloak which is found only in this pack and what's more its free within the pack. Excellent! As always this code can be bought as a pack or as single miniatures or select the three packs and save 10% option on the page. Price 12.50GBP per pack. We hope you like the new Cold Climes and we certainly do. Go HERE. Want to know more about them? They are closely related to the Planetary Defence Forces (PDF) or Militias detailed in IAB03 The Khanate Return and they use the same statistics, weapons and a lot of the same vehicles which you will find in that book. You can see the Patrol Angis game system on the website HERE including the third book in print and as a digital download. 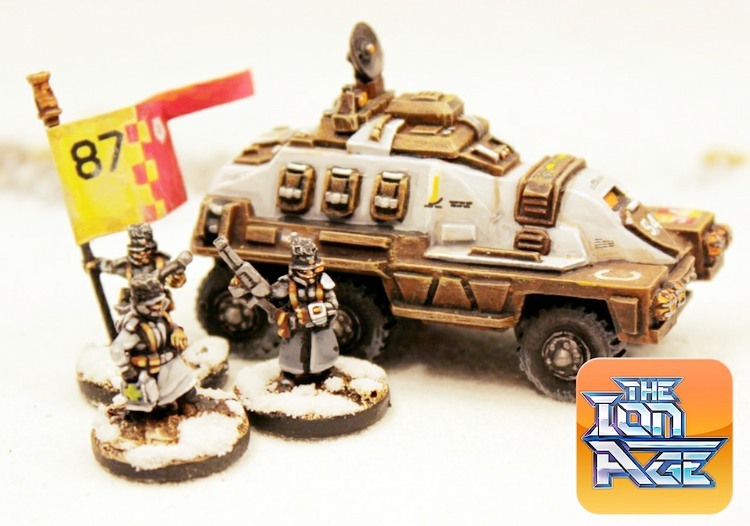 You can see the other Planetary Militia on the website HERE and their vehicles HERE. We have a platoon pack, squads, command, battlesuits, portable weapon platforms and gunners as well as larger vehicles like Patrol Cars and Carriers. 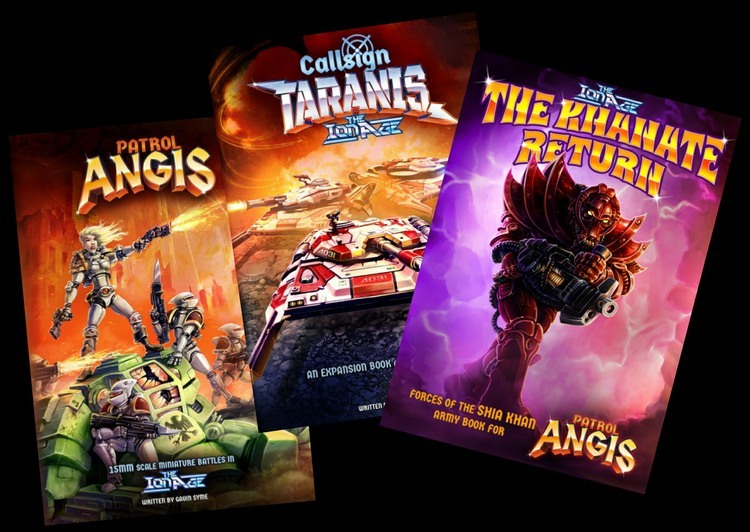 Below are a series of pictures of the Cold Climes doing battle with various foes using Patrol Angis taken from our collection. There is a caption with each one telling you what is going on. 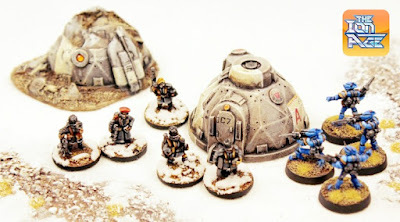 The Above Three Images show an Cold Climes fire team being ambushed by Canlastrian Retained Knights among the Geo Shelters of an attacked settlement. 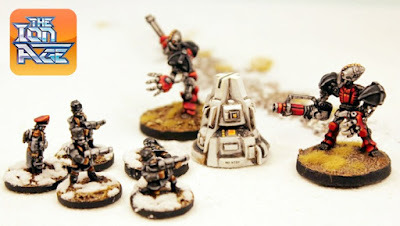 A Cold Climes fire team lays down some hurt against advancing Khanate Legionaries in the shadow of a smashed Red Adder Combat Lifter. A Colabreta Patrol Carrier is temporary home to banner element of the Cold Climes 87th Regiment. 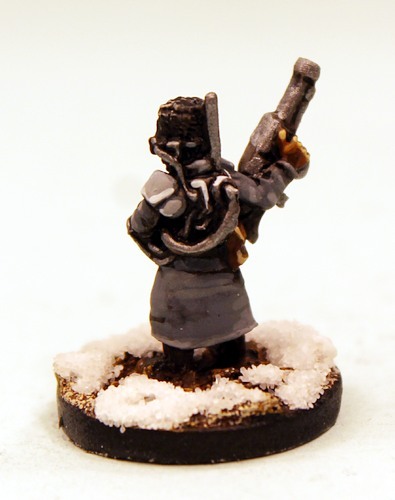 Cold Climes troopers prepare to loose Bodkin shots at advancing Maligs shown from two directions. as they attempt to enter a Command Dome. Frosty chicks! The sniper from IAFP11 next to Missiletoe Claus from the Year Three Collection with a Skylark on its Cradle behind them. a Power Spire against a pair of terrifying Psychoborgs! 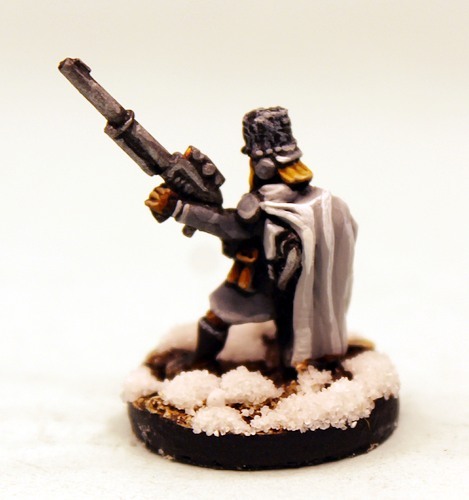 Lastly we have some close up photos of poses from the new packs for you to see. 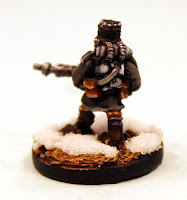 A standard Cold Climes Trooper, a Trooper with Pardoner Fire Projector, a Trooper with Bodkin AP Launcher, A Comms Specialist Trooper and a senior Officer of the Cold Climes. It ends with the free female sniper from the platoon pack. From packs IAF142,IAF143,IAF144 and IAFP11. Nice! 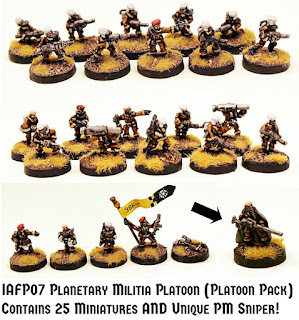 Another pack to add to my list of wants. Keep the coming Gavin! Thank you. We will every month!